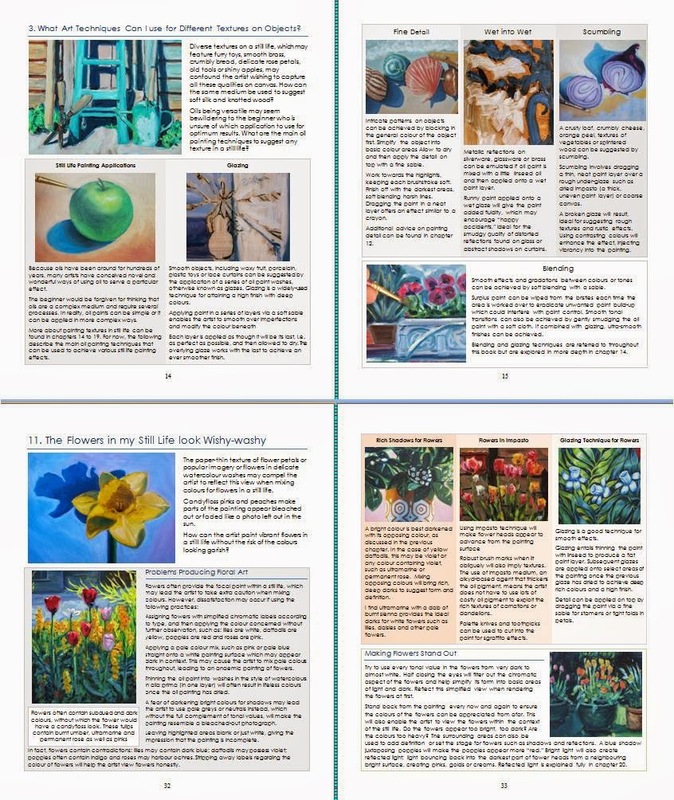 Check out my new book offering solutions for still life painting in oils. It is available on Kindle and now as a Pocket sized edition as well as a large edition. There is lots of advice inside to help with any issue with painting (and drawing) a still life, including overcoming childish style of painting, the Golden Section, drawing ellipses, drawing foreshortenings, composing a still life, lighting a still life, how to paint textures, how to draw perspectives, how to paint light from life, and how to make a rendering of objects appear as though they could be plucked from the canvas. In total, there are 26 chapters in this book including a demonstration on painting strawberries in the back and a glossary. Various art techniques are explored within, such as alla prima, oil painting glazing, scumbling, working impasto and working in detail. Common issues are tackled in depth, such as drawing foreshortenings, or objects with extensions head-on, which might be teapot spouts or handles. Other common problems, are ellipses, which are often rendered with corners or assymetrically. 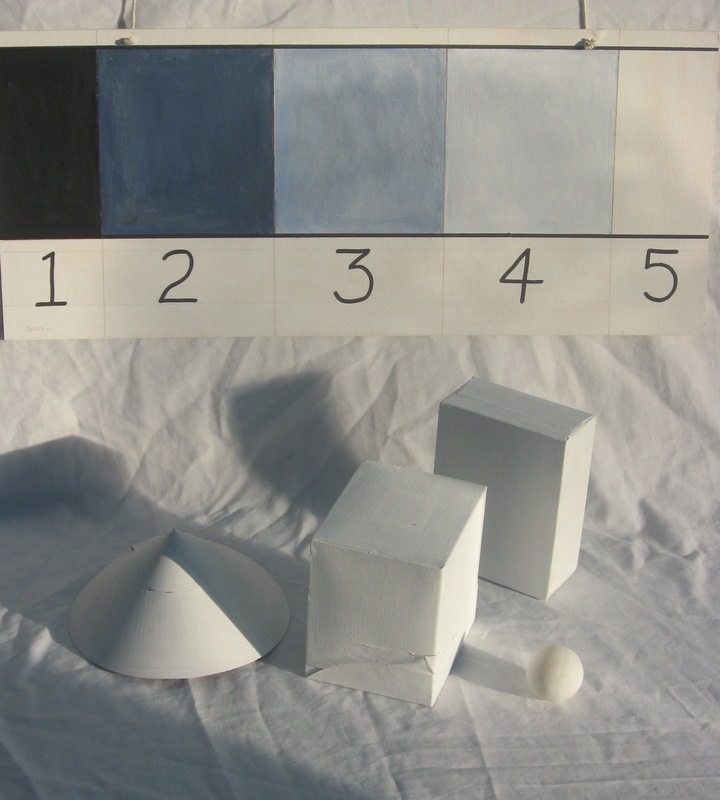 A section on painting objects with angles, such as boxes or biscuit tins tackles common problems with vanishing points and angles that do not converge correctly. Painting rust or aged material can often result in material that looks too new. Painting reflections on glass is also a common issue. Suggested art techniques for painting other textures such as fruit, china and metal are also explored in depth. See Youtube clipbelow for a preview. The screenshot on the right also gives some idea of how the interior of this large edition version looks. As can be seen, each page is crammed with colourful images and bitesized pieces of information. Learn how light and shadow are the secret to convincing still life, which can be achieved by good light. A section on painting out of doors, such as in the garden is also provided. Indeed, painting from life presents its own set of challenges, not least in capturing the changing light into paint. Painting from life is possible with certain strategies, given in this book. Reflected light will suggest form and texture. Reflected light is light bouncing back onto the dark side of an object from a bright surface and is often overlooked in preference to simply light and shadow, but reflected light can make the difference between an average still life and a great one. The beginner might be deterred by a still life painting that looks childish or naïve. Common problems are a still life that leans to one side, not placed centrally on the page or has objects that appears out of proportion to one another. In regards to colour, the tones might appear too washed out, garish or flat. Down to earth and direct advice for the beginner is given to help overcome all these problems, via suggested painting and drawing exercises. Everything the still life artist needs to know can be found within this book, from the art materials needed to the best techniques for various effects. Overcoming common problems with still life painting is the key to moving forward and discovering a new passion for painting. Now available as a large edition hardback measuring 10x8in and 72 pages long. The smaller edition is 8.5x5.5in and is 152 pages long. Kindle edition is also available. How can I Paint Light from Life like the Impressionists? Painting from life will present the problem of the constantly shifting light. The artist might be tempted to keep altering the shadows in accordance with reality, working over the painting until it loses its freshness. In other cases, the light might change before the painting is complete, the sun disappearing behind cloud or sinking behind the house. A painting that remains incomplete is the likely result. How can the artist capture the fleeting light in paint as did the impressionists? The beginner who wishes to take on the challenge of painting from life may overlook problems until the painting is underway. The following might cause problems. Not planning ahead for the painting session. Conceiving, sketching and preparing the composition all on the same day, leaving the artist little time to lay down the paint before the light fades. Employing one or at most two brushes during the painting process. Cleaning the brushes between mixes and mixing repeated colours may rob the artist of valuable time. Deliberating over detail or dithering too much over the painting in the pursuit of perfection. The key to capturing the fleeting light from the life is preparation. This means having the composition ready-sketched and the location decided. Setting up the art materials, such as the palette and easel can also take valuable time. The following pointers serve to elaborate. Prepare the painting surface and the composition on a separate day. Make a note of where the sketch took place. This means that the optimum light is saved for the painting alone. A white canvas can be off-putting and create bright reflections. To counteract this and to make tones easier to judge, I will apply a thin acrylic wash of a neutral colour, such as brown or pale blue over the canvas prior to painting. If painting out of doors, such as in the garden, make a note of where the shadows creep on certain times of the day. Does the house cast a shadow at teatime? Make a note of the weather report if sunlight is sought after. A bright morning can often be followed by heavy cloud, which could put a premature end to the painting session. Use several brushes during the painting. This saves valuable time from repeatedly cleaning the brushes or mixing the same colours. I often employ several brushes at once: one for darks, one for pales, another for bright colours and more for soft blending. If time is the essence, I will block in the larger areas of the painting first. This might be areas of simplified light and dark in the background. The paint will be applied thinly at this stage so that I can add detail or make adjustments on top without the brush picking up surplus paint. I will often render several areas of the painting simultaneously rather than one at a time. This means picking up a “dark” brush, closely followed by a “pale” brush as the painting is worked over. I will record the most transient areas of light and dark first, making snap decisions on hue and tone. This means being decisive. Does that shadow contain blue or brown? Is that patch of sunlight crescent-shaped or triangular? Once the shadows have been rendered satisfactorily, don’t be tempted to change them later. Leave them and move on. Work into the detail as the painting progresses. Don’t worry if the setting no longer resembles the painting. Painting from life means capturing the essence of a day rather than illustrating one moment in full as in the case of a photograph. The final stages of the painting will often involve neatening and soft blending. This means knitting the painting together with a soft brush. Standing back from the painting at regular intervals will help the artist make honest comparisons with the setting. Absolute accuracy is not important, but the capturing the mood of the day. Capturing fleeting moments in painting entails planning ahead and using the paints in a certain way. Sketching the composition on a separate day means the artist may use the time for painting alone. Using several brushes at once will save time on cleaning them and remixing colours. Making strategic decisions on where the painting will take place will prevent un-preceded shadows from creeping across the setting before the painting is completed. And lastly, allow robust brush-marks and colour streaks to remain. It is pointless to pursue perfection in painting if time will not allow; the light will not wait. The artist struggling with ellipses in a still life may end up with a painting dotted with doughnut-like formations that are supposed to represent the rims of cylindrical vessels; some ellipses appear lop-sided, others look like UFOs. In other cases, the ellipses appear to inhabit a different space to that of the vessel concerned. How can the artist overcome the problem of painting ellipses on objects? Giving the ellipse sharp corners. Drawing the ellipse asymmetrically. The ellipse might slant to one side, resulting in a lopsided ellipse, or appear wider on one side than the other, resulting in a tear-shaped ellipse. Rendering the rim of the vessel as a single line without suggesting any depth to the rim depicted. Rendering dark lines around the ellipse, even though lines cannot always be discerned on areas of the actual rim. 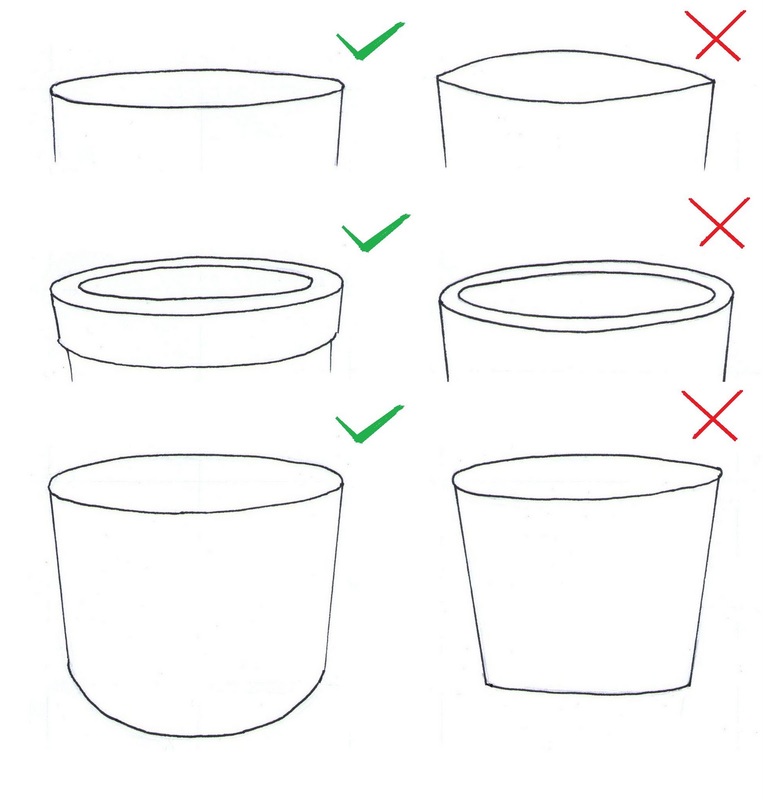 Failing to accord the base of the cylindrical object with the rim at the top, resulting in a vessel that appears to inhabit two areas of space at the same time. A common example is drawing the base of the cylinder as a straight line, and the ellipse at the top as an ovoid. The ellipse of an object never possesses corners, regardless of the obliqueness of the viewpoint. The curve simply becomes more acute. The ellipse element of an object will appear to flatten when viewed at eyelevel, and appear to open out when viewed from a higher vantage point. Head-on, the rim of a teacup, for example will appear perfectly circular. A perfect ellipse is always symmetrical in shape. 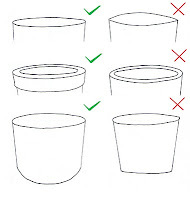 The rim of a vessel pointing towards the viewer will always appear slightly more curved that the rim further away. The curve found at base of a cylindrical shape (because it is often viewed further away) will often appear more pronounced than the curve of the ellipse at the top. Rims of objects always have depth, regardless of how thin. Observe a mug and the rim might be a few millimetres thick. This means the ellipse should never be rendered as a single line but one with two edges: one for the inner rim, the other for the outer rim. The thickness of a rim will appear slightly wider where the ellipse curves towards the viewer due to the foreshortening effect. Firstly, observe the object in front and judge how “open” the ellipse is. Is it almost fully open, like an oval; is it akin to an eye shape, or is it flattened like a disc? Keep this measurement in mind when rendering the ellipse. At the apex of the vessel or cylinder, draw a faint cross. Use a ruler if necessary to ensure the cross is upright, level and centred. Faintly begin to sketch the ellipse. Draw curved edges to the left and right of the cross (where the rim of the object will be) and a flattened curve at the upper and lower part of the cross. Knit each element together using soft, curved lines. Stand back from the drawing in order to view the ellipse at a whole to ensure it is symmetrical. Turn the picture upside down. This will reveal any part of the ellipse that might appear lopsided, uneven or possess unwanted bends. Correct as necessary. Now adjust the curve of the ellipse representing the rim pointing towards the viewer so that it is slightly more curved than the rim pointing away. Give the rim depth. Lightly draw the inner and outer edges of the rim, remembering to give the rim more width at the foreshortening points to the left and right of the ellipse. These outlines may not be visible on the object itself, but the under-drawing will serve as a guide when laying down highlights, shadows or detail on the vessel. Observe the curve at the base of the cylindrical object or vessel. It will often appear more pronounced than the ellipse at the top. If necessary, use the vertical line of the cross as a guide to plot the lowest part of the curve. As before, sketch lightly, using soft, curved lines. Finally, the cardinal rule: keep observing the object in front whilst drawing the ellipse. 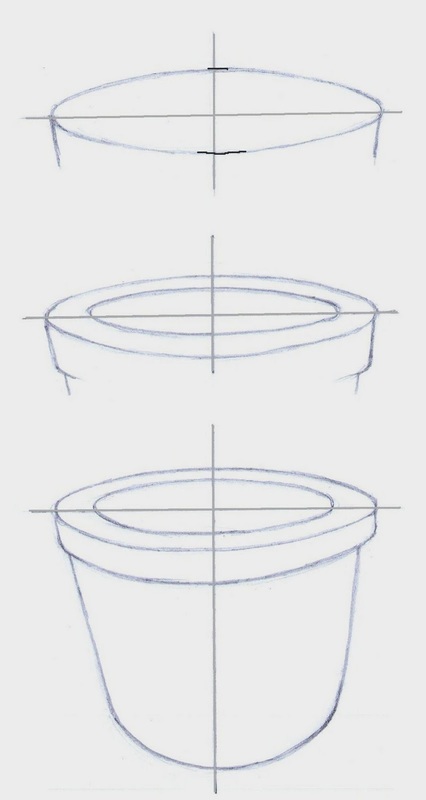 Drawing ellipses is a common difficulty for artists rendering a still life for the first time but simple drawing exercises involving a hypothetical cylinder will help the artist recognise and make changes to practices at fault. Practice is the key. This means the artist may begin to view elliptical objects as an anticipated challenge rather than subject matter to avoid. A painting featuring high tonal contrasts and an array of delicate shades between may confound the artist who is unsure of how to make each tonal value sit together in a convincing still life or landscape. Instead shadows resemble black holes in the canvas, colourful objects lack form, and pale objects simply look insipid. The result is a painting that lacks atmosphere. How can the artist produce a painting that has a strong sense of light and dark and therefore mood? Assuming objects of a particular local colour are always darker or paler than another. For instance, yellow objects are paler than blue ones, and violet objects are darker than orange ones. 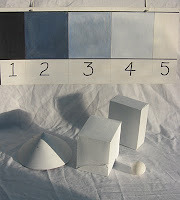 Making generalised assumptions about shadows being black or dark grey, or illustrating them as being the darkest area of the painting; and in similar fashion, assuming an object that catches the light is always the palest area. Viewing highlights and shadows as definite areas of light and dark without thought for the tones between. The result is a painting that seems to comprise of cut-out shapes that lack delicate shades or diverse divisions between light and dark. 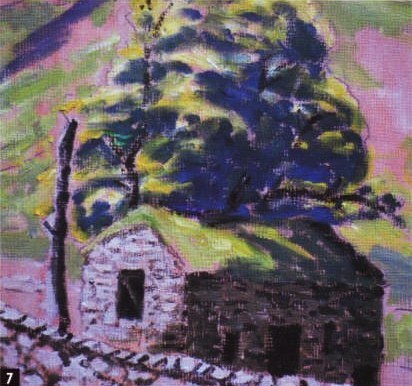 A painting featuring bright colours will often get in the way of how light or dark the objects actually are, and could mislead the artist of the objects’ tonal value. The following simple tips may make the task of rendering shades more effectively. Apply a thin under-glaze of a neutral colour onto the painting surface first. This will kill the overpowering white of the canvas, which could give the artist a misleading impression of how light or dark colours actually are when applied. Half-close the eyes to reduce colour values. Standing back from the painting has the effect of scaling down the image and the subject matter into smaller areas of light and dark that can more easily be processed and therefore recorded onto canvas. The following painting exercise will further raise visual awareness of tones which can be utilized when painting. Obtain objects of simple shapes, such as cuboids, spheroids and cylinders. These can easily be found in everyday objects such as matchboxes, cereal boxes, golf balls and biscuit tins. Paint them white. Place onto a white sheet and arrange in a location of good light source. This might be near a window or lamp. Lightly sketch the objects onto a mid-toned ground. Grey, cream or pale blue would be suitable. Half close the eyes and simplify the arrangement into four basic areas: highlights, light, mid-tones and darks. Begin with the mid-tones areas first, working towards light and dark. View light and shade as abstract forms. Work lightly at first and remember to keep viewing the painting from afar to ensure accuracy. Once these basic areas have been laid onto canvas, work into the detail by applying highlights and adding definition to the darks. In some cases, shadows will vary in shade, some of which will be paler than others. Outlines too, will vary; some divisions being well-defined, others blurred. A further aid can be used and which may help the artist record tonal increments more accurately. Cut a strip of paper or card. Divide into equal squares and fill each square with a particular tonal value, beginning with the palest. This tonal strip can be placed in the background of the setting to assist the artist with comparing one tone with another. Judging colour values form only part of the painting process. Recording tones accurately will give the painting atmosphere and suggest form. Half closing the eyes will help cut out the interference of colour. Viewing the painting from afar will enable the artist to view areas of light and dark as manageable abstract forms on a smaller scale. 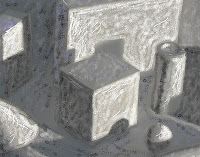 But rendering objects in black and white will help raise awareness of tones without the interference of colour. This skill can be carried forward into general painting practice.